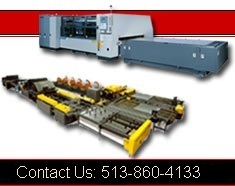 Angle and Flat Bar Line | Controlled Automation | CINCINNATI Precision Machinery, Inc.
max slot size : 13/16" X 1 1/2"
The Controlled Automations ABL-86T Angle and Bar Line is designed to be fast, accurate, and simple to operate. It features TWO 86 ton punch units for simultaneous punching, and like the ABL-100, its high speed servo motors, continuous probing and clamping, and sophisticated servo and valve positioning software make it not only fast, but more accurate than the competition. As with all of Controlled Automation's machinery, this Angle and Bar Line (model ABL-86T) PC based control system gives you an economical and seamless interface with your office programming system. Speed - 0 to 180 feet per minute - The fastest of our angle lines! The high speed servo motor with a rack and pinion probe system allows this machine to move the material at such high speeds without loss of accuracy. Accuracy - + or - 1/32 - Precision encoders mounted throughout the machine allows us to position both length and gauge within any shop's tolerance. Sophisticated servo and valve positioning software provide accurate and smooth positioning. The use of continuous probing and a length probe allow us to maintain this accuracy the entire length of the material without slippage as with other systems that use wheel measuring and no gauge probes. Two 86 ton punch units - With simultaneous punching, you get not only great speed, but also the ability to punch different hole sizes with a single pass. Graphical part programming - We were the first and best with graphical part programming. Keep an eye out for our newest versions of part programming software! Inline Marker System - Our Daisy Wheel type marking system can stamp any alpha-Numeric string onto the material as it is being processed. Just one less thing that will have to be done by hand. CAD interface option - We can interface with many of today's most popular structural CAD packages. We can also provide file formats to you or your CAD vendor so you can output files straight from your system to ours. We can even convert some of your parts from your old machinery software. Metric/Decimal inch part programming - Have a metric job? Get your drawings in decimal inch? We can create our parts in both metric and decimal inch format.